4 Bed – 2 Bath Rental House in the heart of the Mount Washington Valley!!!! 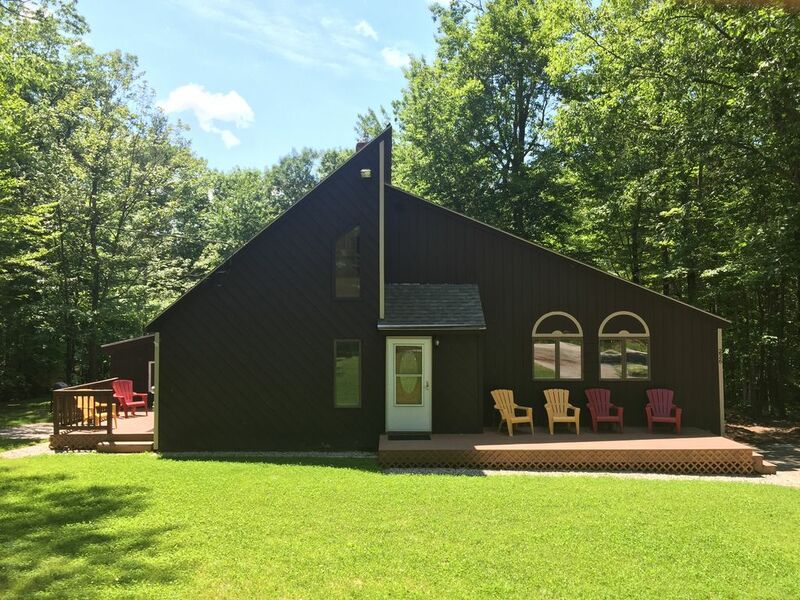 This house is located in the Birch Hill neighborhood of North Conway, NH, minutes away from Cathedral and Whitehorse Ledges and Echo State Park. Birch Hill provides the ease to access historic downtown North Conway (10 min drive), Storyland (15 min drive), and six local ski resorts (Cranmore Mtn - 10 min, Attitash Mtn - 15 min, Black Mtn - 20 min, King Pine Mtn - 20 min, Wildcat Mtn- 25 min & Bretton Woods – 45 min). The house is in a neighborhood on a quiet street, great for walks, runs, and biking - family-friendly & great for kids! Whether you visit North Conway in the summer to hike the trails of the White Mountain National Forest or shop the numerous discount outlet stores; or in the spring to ski Tuckerman’s Ravine; or in the fall to watch the leaves come alive with color; or in the winter to snowshoe, downhill ski/snowboard, cross-country ski or snowmobile — there is opportunity for all to enjoy the fruits of the Mount Washington Valley! Bathroom 1 on first floor and Bathroom 2 on second floor. Seasonal views of the Moat Mountains! 2 decks - front deck & side deck. Patio furniture provided. The house was clean and as we expected. The hosts were easy to communicate with and made it easy for us (linens provided, place to put trash--seriously the cleanest trash room I've ever seen). One thing to know is that the upstairs (loft) bedroom is open to the downstairs so keep that in mind when you're planning who will sleep where if you have night owls or early risers. The house had everything we needed, plus a few nice to haves like games. Our only complaint is that there weren't more dining chairs since we had four adults and four kids, but only six chairs--not a big deal though. Birch Hill is a gorgeous spacious home in the perfect location. Far enough out of the way so you can relax but close enough to enjoy all North Conway has to offer. My family and I cannot wait to be able to visit the areas again next year and hopefully stay here again. We highly reccomend this location. My family and I recently spent 4 nights here and have nothing but positives to say. The property inside and out is immaculately clean and with the owner living next door is great should any issues arise. Short drive to downtown North Conway, Echo Lake and the outlets. Will definitely consider staying here again. We had a great stay here. It was very clean and accommodations were perfect! It's great knowing the owner is nearby if you need something. Would love to come back here and stay again. Location is great! The place was very clean and well stocked. Would come back again. Great place to stay, perfect for kids and our dog. Owner very nice, great central location. It was a hot week and the AC was definately appreciated! This house is located in the Birch Hill neighborhood of North Conway, NH, minutes away from Cathedral and Whitehorse Ledges and Echo State Park. Birch Hill provides the ease to access historic downtown North Conway (10 min drive), Storyland (15 min drive), and six local ski resorts (Cranmore Mtn - 10 min, Attitash Mtn - 15 min, Black Mtn - 20 min, King Pine Mtn - 20 min, Wildcat Mtn- 25 min & Bretton Woods – 45 min). The house is in a neighborhood on a quiet street, great for walks, runs, and biking -- family-friendly & great for kids! Whether you visit North Conway in the summer to hike the trails of the White Mountain National Forest or shop the numerous discount outlet stores; or in the spring to ski Tuckerman’s Ravine; or in the fall to watch the leaves come alive with color; or in the winter to snowshoe, downhill ski/snowboard, cross-country ski or snowmobile — there is opportunity for all to enjoy the fruits of the Mount Washington Valley!